Abu Dhabi: Abu Dhabi National Oil Company (Adnoc) on Monday awarded German oil and gas firm Wintershall Holding a 10 per cent stake in the Ghasha ultra sour gas project, which is estimated to hold multiple trillions of standard cubic feet of recoverable gas. 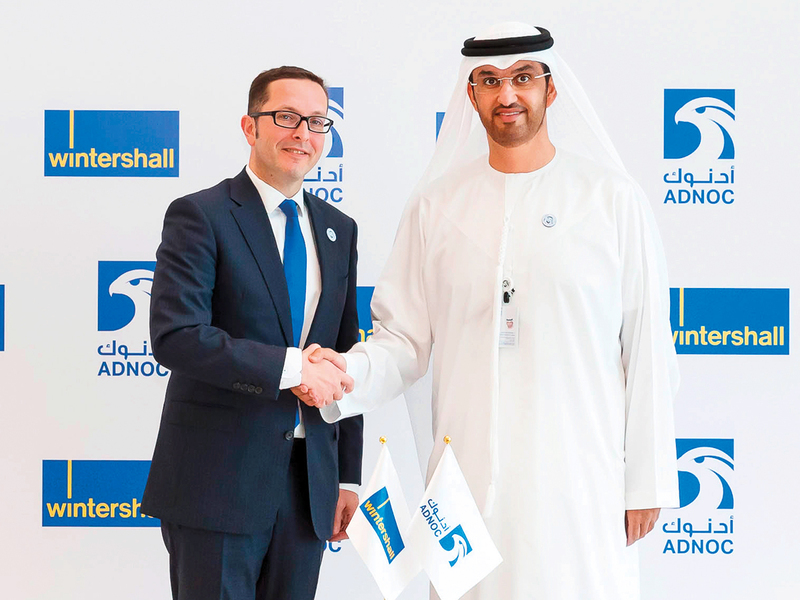 Wintershall is Germany’s biggest oil and gas producer and joins Italy’s Eni as partners with Adnoc in the multi-billion dirham project. The company will contribute 10 percent of the project capital and operational development expenses, according to a statement by Adnoc. The agreement marks the first time a German oil and gas company has been awarded a stake in an Abu Dhabi concession area consisting Hail, Ghasha, Dalma and other offshore sour gas fields, including Nasr, SARB and Mubarraz. Eni was awarded a 25 percent stake in the Ghasha concession earlier this month. “Development of the Ghasha concession area is a strategic priority for Adnoc. The gas, extracted from the concession area, at commercial rates, will make a significant contribution to fulfilling our commitment to ensuring a sustainable and economic gas supply and achieving our objective of gas self-sufficiency for the UAE,” said Dr Sultan Ahmad Al Jaber, UAE Minister of State and Adnoc Group CEO in a statement on Monday. The Ghasha ultra-sour concession will tap into the Arab basin, which is estimated to hold multiple trillions of standard cubic feet of recoverable gas, according to Adnoc. The project is expected to produce over 1.5 billion cubic feet of gas per day when it comes on stream, around the middle of the next decade, enough to provide electricity to more than two million homes. Once complete, the project will also produce more than 120,000 barrels of oil and high value condensates per day. “Natural gas production in Abu Dhabi complements our existing portfolio in an ideal way. We have decades of experience to offer in safely developing sour gas fields. We will contribute our technical know-how, strength in implementing projects and cost-effectiveness, in Abu Dhabi, in the coming decades,” said Mario Mehren, CEO of Wintershall. In addition to developing the Ghasha concession area, Adnoc plans to increase production from its Shah field to 1.5 billion cubic feet per day and move forward to develop the sour gas fields at Bab and Bu Hasa. Adnoc is also looking to unlock other sources of gas which include Abu Dhabi’s giant Umm Shaif gas cap and the emirate’s unconventional gas reserves, as well as new natural gas accumulations. Supreme Petroleum Council recently approved Adnoc’s new integrated gas strategy to unlock and maximise value from Abu Dhabi’s substantial, available gas reserves, as the UAE moves towards gas self-sufficiency and aims to transition from a net importer of gas to a net gas exporter.